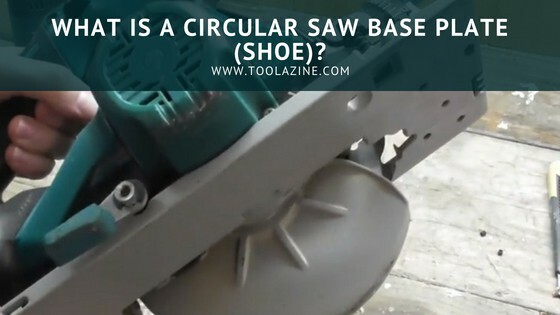 Toolazine What is a circular saw base plate (shoe)? What is a circular saw base plate (shoe)? Just as you need to understand its features, it is crucial to have some basic knowledge about the parts of the circular saw. So, do you know what is a circular saw base plate shoe? Basically, it is a sheet of metal that forms the bottom of the circular saw. The base plate shoe is designed in order to distribute the weight of the blade over a greater area and give the operator better stability. It rests on the board and keeps the saw straight when you are cutting. Circular saws have improved very much throughout the years, but there are several parts that are crucial for every saw. No experience with circular saws? Don’t worry about that. Related: What is a circular saw? In this video, you can get a visual of them, understand their functions and see where they are located. Related: What is a circular saw electric brake? Related: Who invented the circular saw? Why is the base plate shoe so important? It is common sense that every part has its function, otherwise it wouldn’t be there, right? So, in order to understand the importance of it, imagine what would be like to cut without having the base plate. The shoe base plate lays on the board which allows you to make straight cuts giving you the stability for that. If you don’t have this part, the whole weight would be put on your hand, and I really doubt that you will be able to follow a straight line like that. Even if you could, it wouldn’t be even close to a cut made with a base plate shoe on. There is absolutely no way to make a bevel cut without the base plate shoe. This type of cut is made when the base plate is tilted at a specific angle. If you have ever built something, you already know how important bevel cuts are. Before you start cutting, you need to have a line drawn on the board. This should be your guide in order to make the desired cut. So why do you need this indicator then and what is that actually? It is a small cutout on the shoe base plate that allows you to follow the markups you on the wood. Once you reassemble your saw, you will understand the connection between the base plate shoe and all the other parts. How can you do that? Check the next paragraph. If your circular saw blade is not square with the base plate when the bevel is at zero then your cuts will be off. Even a couple of degrees off can make a big difference but you may not notice or understand why until you check. The good news is that it is easy to check and adjust most circular saws. To check and adjust a circular saw blade is square with the base plate you can use a speed square (also known as a layout square). To do this set the bevel to zero and then place the layout square on the circular saw show against the blade avoiding any of the blade teeth. If the speed square touches all the way on both the shoe and the blade then the blade is square. If it does not then you need to adjust the bevel adjustment set screw. This is usually accessed via the bottom of the base plate. Turn the screw until the speed square touches all along both the show and the blade. Then it will be square. Before you start, make sure that the saw is turned off. Once you unplug the unit, get your toolbox and you are ready to start. First of all, remove the blade and after that, remove the retaining ring as well. This should be an easy process and if you have ever replaced a blade you will know how to do that properly. Next thing you need to do is to pull the blade guard and over the stopper so you can remove it. The step after this is the removing the screw using the allen wrench. When you finish with that, remove the nut, the E-clip, and the lever. Depending on your saw, this may vary, but the next thing you need to do is to remove the sleeves and the nut (in case you didn’t remove the nut in the previous step). Then, continue with removing the bolt and prying off the base plate, and you will see that you are almost done. Pry the E-clip, remove the lever, the washer, and the bolt. There should be another thing left on the base plate – the wing nut, which you can remove it by hand. Unscrew the dial and remove it with the ball and the spring. With that, you have successfully removed the base plate. There are many parts, so remember where you leave them and create an order that is the best for you, as you will need to get them back and the last thing you want to happen is to notice that a part is missing. Now what? You can replace any broken parts, or replace the shoe base plate. Since not all circular saws are the same, some of the steps may vary, but generally, this is it. It may sound complicated, but once you get to know you saw it will be much easier. In order to understand this easier, take a look at this video. Every part of the circular saw is important, as without any of them the saw wouldn’t function as it does. It is crucial to have some basic knowledge about them, like to understand what a base plate shoe is, and how to replace it. Have you ever replaced a base plate shoe? Tell us your experience with it – leave a comment and feel free to share this.